First major success: +8 =1 -0 at Manila Olympiad in 1992. By GM Artur Jussupov -Grand Master Artur Jussupov on the chess philosophy, playing style and strengths of the two contestants. Artur Jussupov, himself three times world championship semifinalist, is part of the official team of commentators for the World Championship. 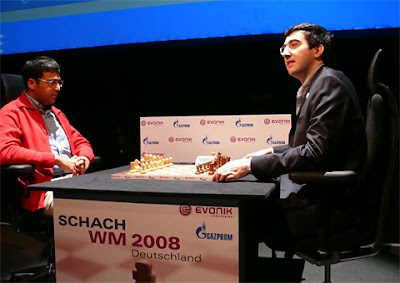 After a long period of waiting the time has come at last: we are to witness the World Championship contest between Viswanathan Anand and Vladimir Kramnik in Bonn! Like many other chess friends I am hoping for exciting games. This hope is well founded because this is a meeting of two completely different types of players with different chess philosophies. At first glance the differences could not be greater: the “tactical god” Anand meets the “endgame god” Kramnik. Anand, the enthusiastic player and world champion from India, feels in his element when he finds himself in a complicated position. Kramnik, however, prefers a systematic, strategic game where he can keep control of his position. So are they two opposites like fire and water? It is not quite that easy in modern chess. In top chess the preparation for the opening has by now gained such great importance that it might be compared with the service in tennis. And therefore the player who prepares more skillfully and can provide more surprises in the opening game may be the winner. Of course, the top players must be good at all phases of a game – they must master any situation and be able to act in a versatile way. Consequently the best players are becoming more and more universal. So someone like Anand will not be “at a loss” in the end-game, and someone like Kramnik will also hold his own in a confusing position. But still: if there is a “long rally“ – to stay with the tennis analogy – the stylistic differences gain in importance. Anand is an attacking player by nature, he can calculate very quickly and will never overlook his own tactical advantage. He also has a good positional instinct and cultivates an aggressive but at the same time natural manner of playing. In the course of the years he has improved in many fields, especially in the defence. He is strong in the opening game, plays some aggressive variations with black, thereby winning many games “following up”. And he can play solid systems. Anand has found the necessary inner balance – and he is at the peak of his chess career. Kramnik has developed in a different direction. Since his historic victory against Kasparov in London in 2000 the Russian has concentrated more and more on his strengths: deep preparation for the opening, a unique positional instinct, excellent technique in the end-game. In almost all his winning games he played White; with Black he pragmatically plays for a draw. Kramnik achieves most victories in the end-game, for him an attacking game is a rare exception. He is very strong on defence – and he very rarely loses. In the following comparison chart I would like to outline my – naturally personal – opinion about the strengths of the players in the various components. The maximum number of points in each category is 10. This is not an “absolute value”, it is intended to indicate the player’s position and his strength in this segment among the top ten players in the world ranking.